Review last weeks lesson. 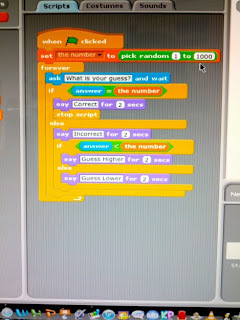 Did the students do any exciting projects with Scratch since last week? Get into pairs of students. Student B needs to guess the number on Student A's card. Discuss the strategies used to guess the number. Any person can guess any number buy using a process of elimination within 10 guesses. By simply guessing the median of a range of numbers. The responder then replies with one of three responses; correct, too high, or too low. The guesser's 2nd guess is again the median of the remaining numbers, and so on. The computer guesses the answer. 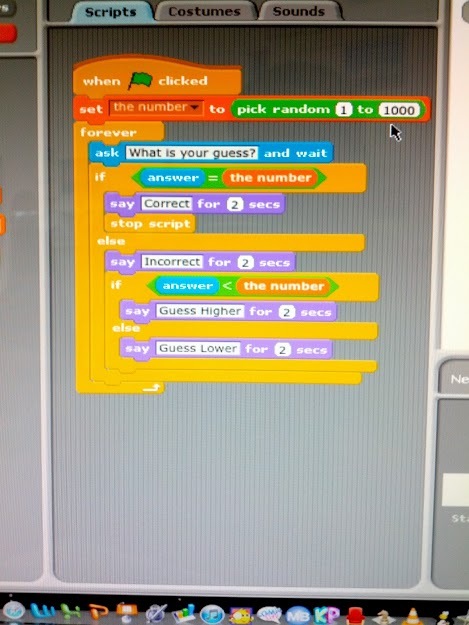 Add code that counts the number of guesses required to find the answer. At the end of the program the sprite should tell the player how many guesses it took. Use a "join" line to make a sentence.